Play first home game of season Thursday at 3 p.m. The Crested Butte Titans boys hockey team opened up play in their new league with a big challenge and, despite losing, it appears the squad is right where it needs to be as far as competition level. The Titans made the move to the high school league this season after spending a couple of years in a mishmash club league. The hope was that they would find tougher competition and a level of play that would help push the Titans to a stronger game of hockey. 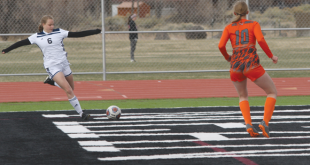 They got their first big taste of the new league this past weekend as the Titans headed to Denver to face Mountain Vista on Saturday, December 3. Not much was known about Mountain Vista as the Titans prepared, other than they were ranked seventh in the state in pre-season polls. Head coach Joey Otsuka had his team concentrating on their own game as they prepared for season opening and made sure they were as prepared as they could be, given a lack of ice time during pre-season workouts. But the Titans were well aware of the potential of their opponent so Otsuka had to make sure they remained free of any pregame distractions as they warmed up for the game. “I just wanted them focused and not intimidated before the puck dropped,” says Otsuka. The Titans came out strong in the first period, going toe-to-toe with Mountain Vista, and continued to gain momentum as the first period played out. Mountain Vista scored first but the Titans responded less than a minute later as Patrick Seifert broke free out of the neutral zone to take a pass from Gage Meredith and scored, leaving the two teams tied 1-1 after the opening period. “I think they realized early that they could play with this team and the first period was a great way to start out the season,” says Otsuka. The Titans then struggled in the second period. Games in the new league include a longer break between the first and second periods as they resurface the ice, and the extended intermission threw the Titans off their game. 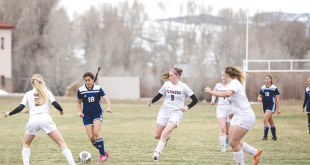 Furthermore, it gave Mountain Vista a chance to regroup as they realized Crested Butte is more than just a mountain town hockey team they would steamroll right over. Mountain Vista picked up their game, outshooting the Titans 17-4 in the second period, scoring three goals, and building a 4-1 lead heading into the third period. Otsuka used the next Zamboni break to bring his team back into focus and the Titans took over the pace and play of the game in the third period. John Smith scored in the third period as the work of Lucas Solanik and Jordi Nichols opened him up for the goal and the Titans kept pressing, but eventually fell 4-2 in the end. The Titans will host their first home game of the season on Thursday, December 8 in Gunnison when they host Castle View; the puck drops at 3 p.m.
“We can play in this league—it’s just about putting miles on the tires,” says Otsuka.